Back in the day in merry olde England—before rock was huge and 12 year olds had tinnitus from 100 watt stacks—an 18 watt 2x12 combo was all you needed to set toes a-tapping at the local garden fete. A few years later, some crazed Limey decided to crank just such a combo into distortion and found it produced a brilliant, compressed sustain perfect for the blues. People started selling their souls to find these rare gems, but you don’t have to because we’ve recreated that vintage setup—and with all the mod cons. 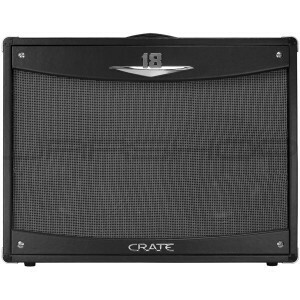 Crate’s new V18-212 combo features single-channel, Class A design with gain and master volume controls, 3-band EQ, and spring reverb, making it one of the most versatile little amps around. This baby produces sweet cleans and warm, smooth overdrive from its dual cathode biased EL84 output tubes, punching 18 watts into dual 12" speakers for the perfect pub/club amp.